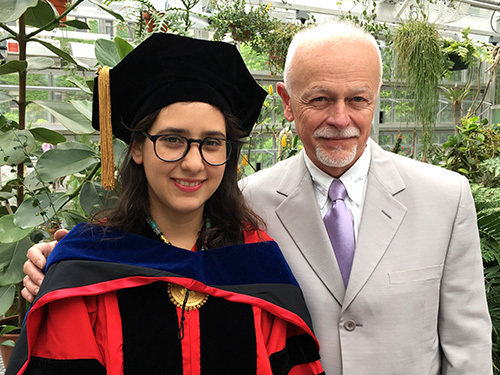 The Plant Biology Section is proud to announce that the 2017 Katherine Esau Award was given to Mónica R. Carvalho for her paper entitled The Hydraulic Architecture of Ginkgo Leaves presented during the 2017 annual meeting of the Botanical Society of America (BSA). The Esau Award is one of the most prestigious awards given to graduate students by the BSA. 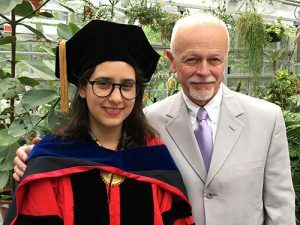 Dr. Katherine Esau is remembered by countless students as the author of Plant Anatomy and Anatomy of Seed Plants, which are among the most influential textbooks in structural botany in the second half of the last century. In 1957, Dr. Esau became the sixth woman elected to the National Academy of Sciences. In 1989, she was awarded the National Medal of Science by President George Bush. The Esau Award was established in 1985 with a gift from Dr. Esau and is augmented by ongoing contributions. It is given to the graduate student who presents the outstanding paper in developmental and structural botany during the annual meeting.